About the book Drawing on a lifetime of experience, Vince Barabba sets out, in The Decision Loom, the four core capabilities that any organization needs to put in place to make his proposed approach to decision-making work. They cover 1) having an ‘Enterprise Mindset that is open to change’, 2) thinking and acting holistically, 3) having an adaptable business design and 4) using the right combination of problem-solving and decision-making methods. Part 1 of the book – The Journey – chronicles the author’s professional life, focusing on more than 30 ‘Lessons Learned’. To name just one: ‘Surface and make explicit the underlying assumptions that would have to be true for your particular problem-solving approach to prevail.’ Each lesson is derived from – and illustrated by – his professional experience in major political campaigns and at Xerox, Kodak, GM, the U.S. Census Bureau and elsewhere. 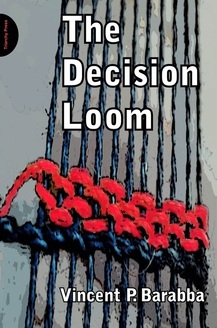 Part 2 describes an ‘Interactive Decision Loom’, sets out the capabilities required to make it work, and sketches an ‘idealized design’ for creating a Decision Loom in your own organization. It focuses on the process of inquiry (which must underpin decision-making), anticipating problems, and the four core organizational (not individual) capabilities needed in a dynamically complex organization (that is to say, all organizations). The four capabilities all draw on the lessons learned in Part 1 of the book and are illustrated by brief case studies from: LEGO, Xyntéo, Patagonia Clothing, Nintendo, Cisco, and McDonald’s. Greater interaction across the enterprise leading to an enterprise that is greater than the sum of its parts.